After receding to a relatively low simmer earlier this month, Race has boiled up again as a campaign issue, coinciding with Donald Trump’s attempt to reach out to minority voters. And Immigration, a related hot-button issue, is spiking as well, as Trump appears to modify his hard-line stance. In the two weeks following the parties’ national conventions, from August 1st through the 14th, only 6% of the issue-related conversations involved racial issues, well behind Foreign Policy/National Security, Terrorism, and Guns. But look what’s happened in the past eight days, since August 18th. Race’s share of the conversation increased to an average of 17%. On August 20th, two days after Trump first raised the question he has now repeatedly aimed at voters of color, “What do you have to lose?”, race eclipsed national security — consistently the leading issue in this election so far — with a 24% share of the conversation to national security’s 22%. Yesterday, after the candidates traded some of their most caustic attacks around the race issue, the margin was even bigger, 26% to 15% for national security. Electome’s Incivility Index, which tracks tweets that contain profanity, ethnic and sexual slurs, insults, and calls to violence, spiked on August 20th and 25th as well, with a full 61% of uncivil tweets on the 20th related to race. The share of talk about immigration has also started to rise significantly as Trump adopts a seemingly more conciliatory position. 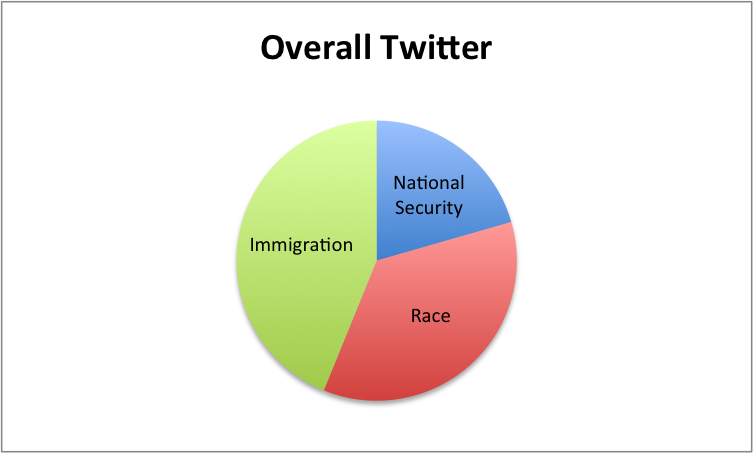 Yesterday, immigration was the most tweeted-about election issue in the overall Twitterverse, commanding nearly a third (32%) of issue-related tweets. Race’s share of yesterday’s conversation was 26%. For unique followers of Trump and Clinton, however — people who follow one or the other but no other presidential candidate — there was even more conversation about race than about immigration yesterday: 29% versus 26% for Trump’s unique followers, and 33% versus 28% for Clinton’s. The race card is back in play, with each candidate betting that he or she has the stronger hand. Andrew Heyward is a visiting researcher at the MIT Media Lab’s Laboratory for Social Machines . Uzra Khan, a recent graduate of Harvard’s Kennedy School of Government, is spending the summer as a project manager there. Soroush Vosoughi and Prashanth Vijayaraghavan, researchers at the Laboratory for Social Machines, developed the analytics for this post.